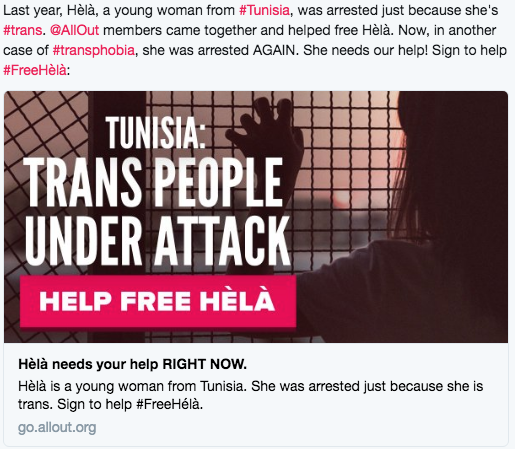 Héla was arrested in Tunisia simply because she’s a trans woman. All Out members helped build international pressure and a judge announced she won’t go to jail. Héla, a trans girl from Tunisia, was on her way home after a fun night out with friends when the police stopped her car and arrested her – just for being transgender. They insulted, beat, and tortured her – and because Héla stood up for her rights, they started a prosecution against her. A transphobic judge convicted Héla of "indecency" and sentenced her to four months in a men's jail, exposing her to even more violence and abuse. On February 23, the day of Héla's appeal hearing, we delivered more than 45,500 signatures to Tunisia's Prime Minister – and it worked! Despite requiring her to pay a fine, the Appeals Court decided to completely free Héla. "Thank you very much to All Out members who have been by my side to get me out of prison in a short time." 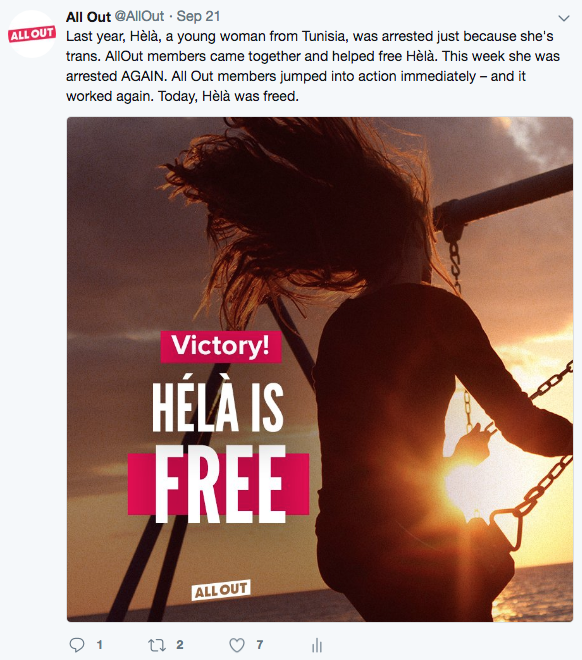 On September 17, 2018, Hèla was arrested again for "indecency" by transphobic police officers who insulted her before taking her to a men’s jail. She was held in a cell with 50 men found guilty of very serious crimes, including murder. As soon as we heard about it, we reopened the campaign and All Out members raised again their voices in support of Héla. We also delivered once again more than 49,000 signatures to Tunisia's Prime Minister – and it worked! On September 21, the Court decided once again to completely free Hèla.